Crafternoons at The Gardens are in full swing. Gadora has been itching to play, and a recent score at Goodwill yielded the perfect mini project. My Hustlers have been toying with unicorns. Originally designed as a team who paid tribute to the female sports stars of the seventies (think Farrah Fawcett in her heyday), we’ve been working on overhauling our uniforms for 2013. It is a new year, and we are ready! We often giggle about the ridiculousness of the single-horned mythical creature. After all, a few of the Hustlers were reared in the seventies, and all recall fantasizing we’d one day have a unicorn of our very own. Gadora was supposed to bring a used gift to the Hustler holiday party. 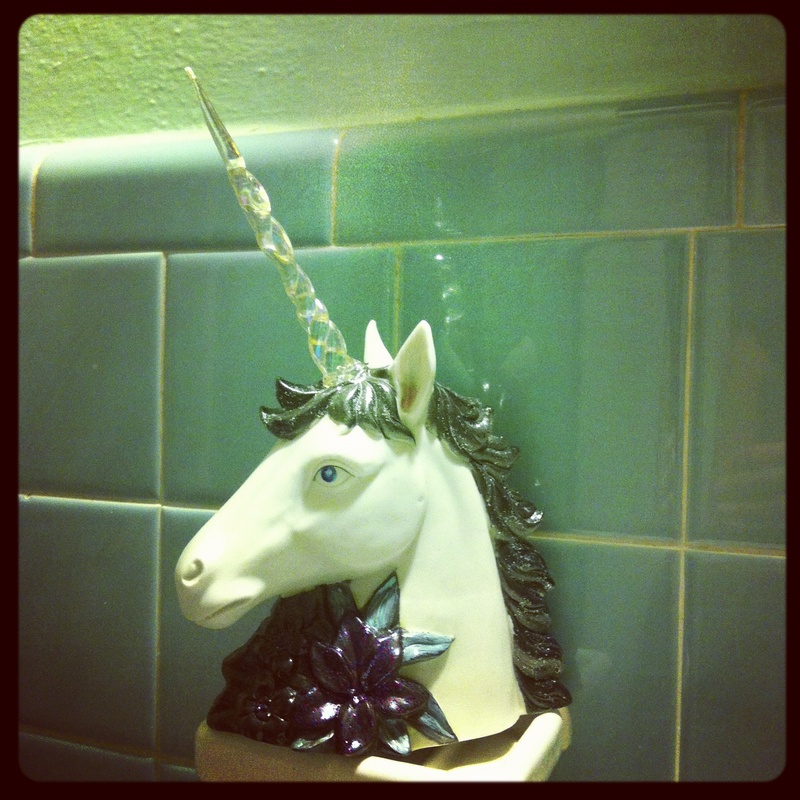 We’d just named 5 women to the team, and Scrape was poised to wow them with my White Unicorn gift. But… I like the finished product so much I’ve decided to keep it through the holidays. She was hornless when I spotted her. A sad little unicorn on a dirty shelf sat near three wicker baskets, a gnarly spatula and a terrible mason jar sand sculpture even a parent couldn’t love. 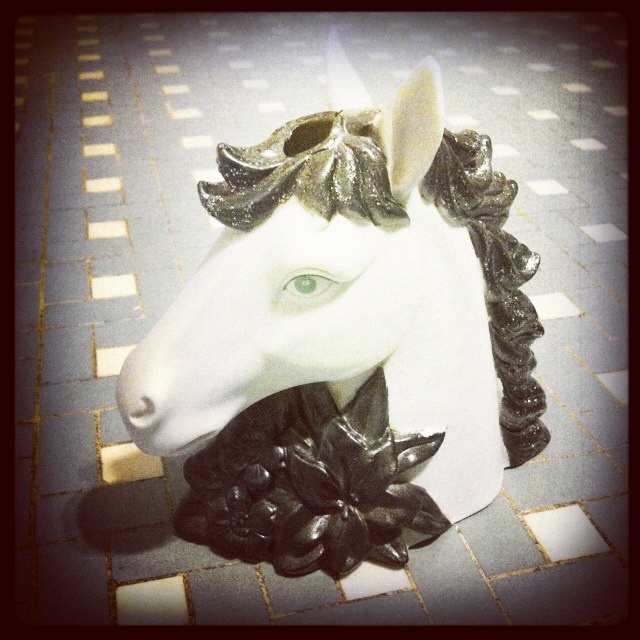 A marble for a horn, I contemplated if the $2.99 was way too much. Gadora had visions of grandeur. The marble would have to go. At first I thought I’d repurpose a tiny cake decorating frosting tip, but the thrift store didn’t have that in store. Never mind. 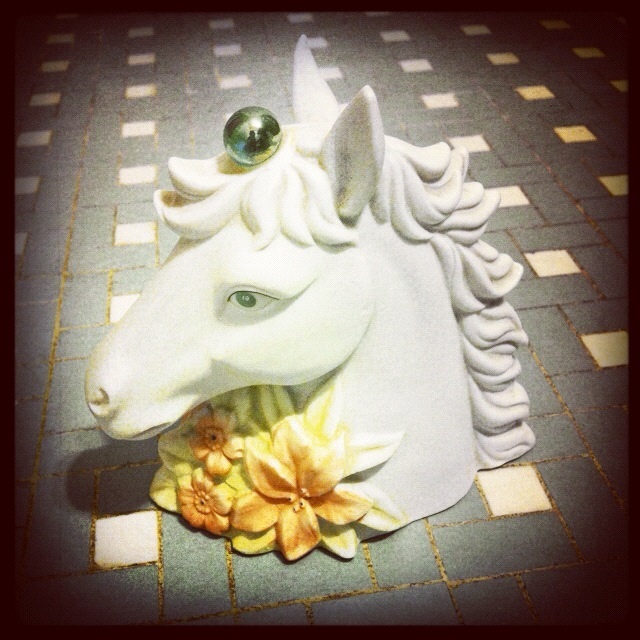 I used my hair dryer and pumped some heat on the marble, tapping it lightly with my hairbrush as it heated. 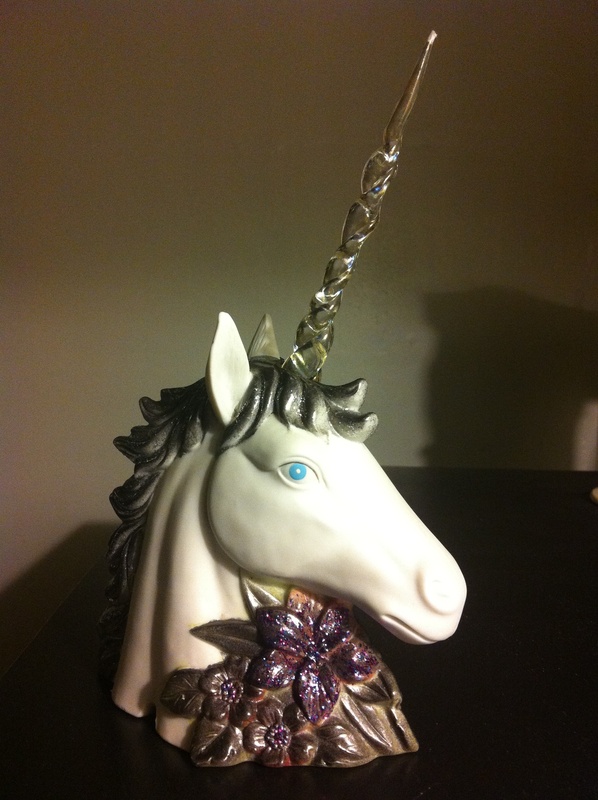 A minute later it freed… and my unicorn was ready for the next treatment. 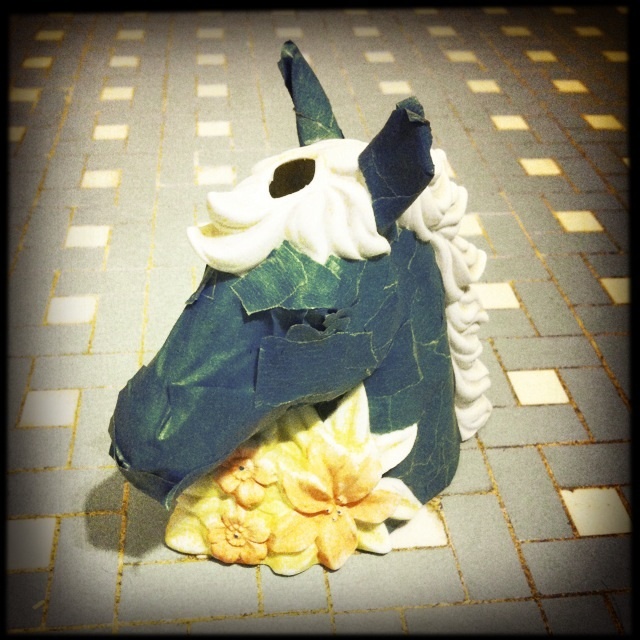 Unicorn ~ with painters tape. 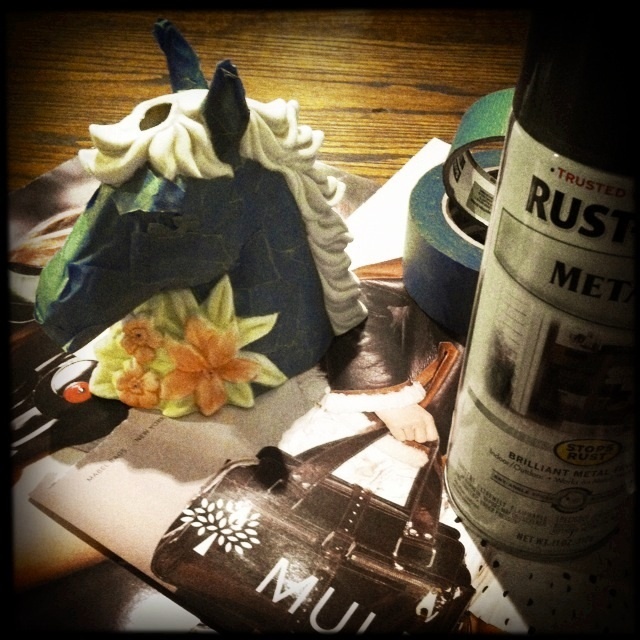 Painters tape is a unicorn-makers best friend. Gadora painstakingly placed teeny pieces around all the bits I didn’t want sprayed. Unicorn covered, I took my project outside and sprayed her down. All the pastel bits covered, I wasn’t fully satisfied. So I broke out the glitter paint. 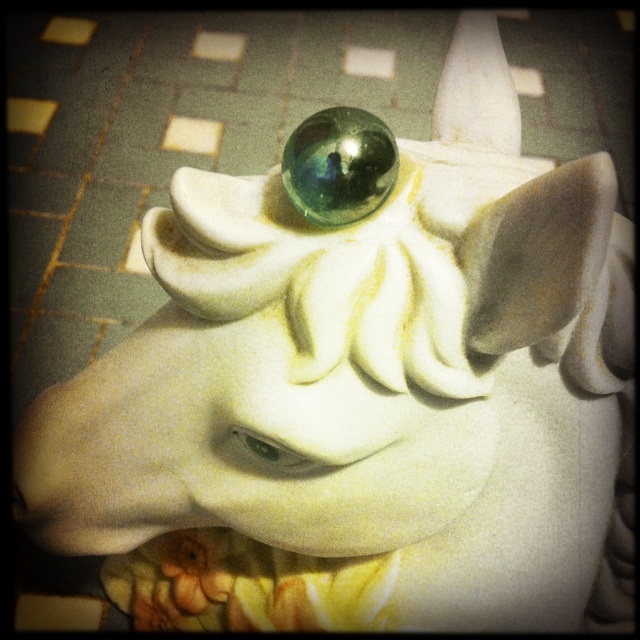 And the baby blue nail polish… only thing left was to appoint a horn. I sat with her for a minute. Then remembered I had a smallish box of holiday ornaments. I dug out an icicle and the tacky super goopy glue. And voila! I thank the Universe for the opportunity to revive a crappy tschotske and for a lovely afternoon.